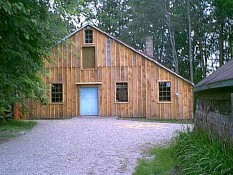 The Harrington Community Club is dedicated to the preservation of rural heritage and the authentic restoration of the Harrington Grist Mill as a functional museum and working educational site. Coordinator of the Harrington Mill restoration, Trent Littleton, accepts a plaque in recognition of the $70,800 Trillium Foundation grant received by the community group spearheading the project. Presenting the plaque are Foundation regional staff person Sheila Simpson and Oxford riding Conservative MPP Ernie Hardeman. Welcome to the Harrington Grist Mill Restoration Project Website. The mill is located in Harrington Ontario Canada. We would appreciate if you would sign our guestbook. We would also like to thank our Sponsors. Having trouble viewing the reports?